The following contains spoilers for upcoming episodes of The Office. Proceed with caution. The first pics from The Office’s Phyllis Lapin’s upcoming wedding to Bob Vance, Vance Refrigeration have been posted over at JustJared.com. We are cordinally all invited to the wedding when it airs on February 8th at 8:30pm EST. Check them out here (or click on the image below). > Pam looks beautiful in her brown dress. It reminds me of another dress we once saw her in, no? > Is it me or does Angela look 16 years old in that picture? > Kelly Kapoor is looking HOTTER than we have even seen her. I love the short hair! > Pam is NOT sitting with Roy (or Jim) during the ceremony. Let’s hope Jam are at least close enough to share googly eyes (yes it’s a cliche, but I’ll take it). My eyes spy that Dwight is sitting in row 9 on the left hand side of the church, and Pam seems to be sitting in Row 9 on the right side of the church. Why aren’t they all sitting on the bride’s side? Either way, Jim and Pam may be one row away…that’s got to be a good thing. Ugh, or maybe not as it seems Karen is sitting next to Jim. Come on already…Karen?! Really? > Oh and who is sitting next to Pam’s ex-fiance? Anglea…oh snap, you think Angie is going to her flirt on? > Who is sitting next to Jim? It’s really hard to say, but check out the pic of Kelly & Ryan, and there seems to be a woman sitting in front of Ryan. I’m stretching here, but could it be Karen? > And Phyllis looks so gorgeous and happy. Be good to her Bob Vance. Yes GMMR, Jim looks VARY hot!!!! And i do think we have seen Pam’s dress before. It looks like Jim is talking Maradith but why would he be talking ot her? I love Kelly’s hair!!! And Dwight is just to funny! I hope Karen dumped Halpert. Cuz if she didn’t…. She’s going down!!!! Otherwise, thanks for the pics, they ROCK!! Lola, in the picture of Pam you can see Roy sitting two rows behind her with Angela. He’s facing Angela and appears to be talking to her. GMMR, where do you see Karen? If it is true, I agree with you…Really, Karen? Really? It’s a stretch, but you can see someone to the left of Jim…a little behind Dwight’s head. It’s def a girl, and in the pic when Jim is looking straight ahead, you can see that this woman is looking at Jim. In the pic of Ryan and Kelly you can see that there is a woman with an up do in front of them…and next to Jim. Great pictures! As usual, I cannot wait for this episode… I esp. can’t wait to see next wek’s convo. b/w Karen and Pam! Good Eye, GMMR! You should become a volunteer sherriff in your neck of the woods and maybe you can help solve some crimes! So is it just me or is Dwight wearing his dead granpa’s tux? I love how they bring little things like this back for us true Office fans! Oooo, you’re right, CrazyGringa, thanks for pointing that out to me! Nice to know that Pam’s not next to Roy. But who, then, IS she sitting next to? Is it Toby? Pam does NOT look happy in that shot. Not one bit. Double order of angst, to go please. LaLa, I didn’t even think of Toby! We haven’t seen any pics of him so maybe he is next to her….It’s a possibility. So, I wonder if they are going to post any pics from the reception. That would be awesome! 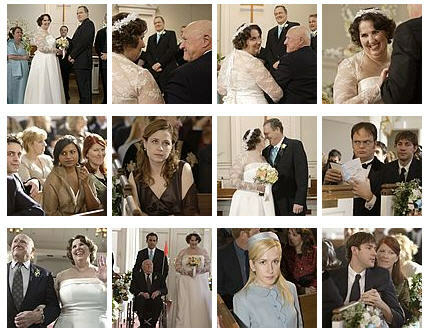 Did you guys notice how Jim is looking across the aisle and down a little … RIGHT AT PAM! He’s in aisle 10 and shes in aisle 9. 😀 Yay. Plus, Pam’s probably not happy since she got engaged WAYYYYY before Phyllis even met Bob Vance, and she has still yet to be married/together with her soulmate. Ooo sorry, i thought I stopped the 1st one from posting because I wanted to add on to it, but I guess I didnt. Is that Toby sitting behind Angela? I love, love, love Pam’s dress, it looks great! Phyllis looks fantastic! I can’t wait. I love Angela’s outfit, its awesome, I now know what she wears to church each and every week! I love Kelly’s haircut, so adorable. in the one w/kelly and ryan i see a fuzzy man shaved head or something. i dont see a woman. also, in the one where jim is staring straight – how can you tell a woman is staring at him? I love how everyone has gone “Veronica Mars” to figure out the seating arrangements! When I saw these pics I felt that Jim looked extra hot (did not know that was possible!). I know what I’ll be dreaming about tonight! It looks like Meredith, Kelly and Ryan are sitting directly behind Jim AND I don’t see Karen or Andy! Could that mean that they have left??? I haven’t heard whether Ed or Rashida have extended contracts and I know this week, Karen confronts Pam about her past with Jim. Interesting! Thanks for posting!!! Andy will be back, but he won’t be appearing in any of the Feb episodes. Karen is still there, and she is def in this episode. Many have speculated (and I agree) that karen is sitting to the left of Jim. You can see that there is a woman with dark hair (in an up do) sitting with Jim. yeah, I thik she is there. You’ve gotta look at the picture GMMR linked in the text with ‘Karen is sitting with Jim’ and then zoom in on Dwight’s neck. You can see the back of her hair to Dwight’s right and her bangs to his left. Could the hair next to Jim be Kelly’s? Kelly’s sitting next to Meredith in her photo, but Jim is sitting next to Meredith in his. Maybe Jim arrives late and scoots in between Meredith and Kelly? Never mind – the thumbnails screwed me up. I see things totally differently in the big versions!